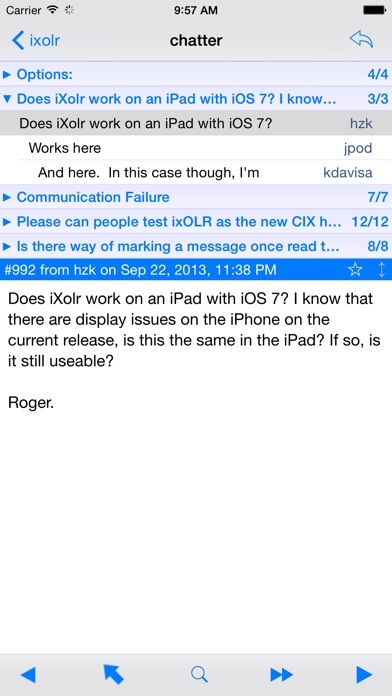 iXolr - CIX Offline Reader app: insight & download. iXolr is an off-line reader for CIX Conferencing, one of the first social networking systems. CIX has hundreds of conferences where people communicate via text messages in a moderated, spam-free environment. An off-line reader is like an email client, allowing you to grab the latest messages in a quick burst, then read them off-line at your leisure. It optimises your bandwidth usage, gives you a user experience tailored to the iPad, and lets you work in places where you don’t have a network connection. You must have a CIX account in order to use iXolr. * View and search the directory of all CIX conferences.